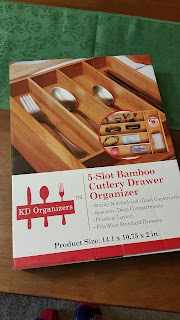 The KD Organizers 5-Slot Bamboo Cutlery Drawer Organizer will bring upscale good looks and order to your kitchen or any room in the house. Choose the organizer with the best features. Ditch those cheap plastic silverware trays and get an upgrade in more than just looks! 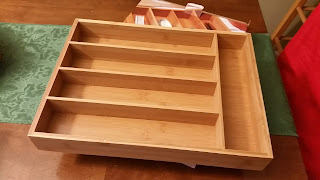 This sturdy organizer not only looks luxurious but fits more pieces than molded trays. 5 roomy compartments arranged in a practical layout; all rectangular, so you decide which utensil goes where. Exact outer dimensions are 14.125 in x 10.75 in x 2 in. Compartment sizes are: 10.25 in. x 2.38 in. x 1.5 in. deep (4 compartments), 10 in. x 3 in. x 1.5 in. deep (1 compartment). Solid and strong enough to carry fully loaded with flatware. Ideal for tabletop use where it is on display. Features notched and glued construction. 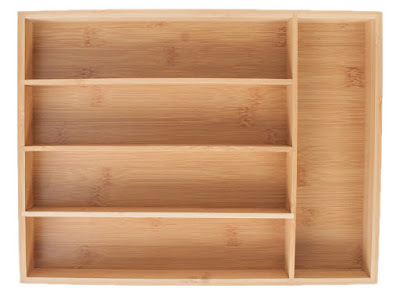 Bottom is constructed of strong MDF with a high-def bamboo look that blends right in with the solid bamboo sides. Try it in the bathroom to corral cosmetics, tools and more. 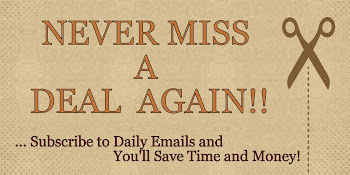 Tackle that desk drawer or junk drawer once and for all! Use it in your utility room to organize hardware. 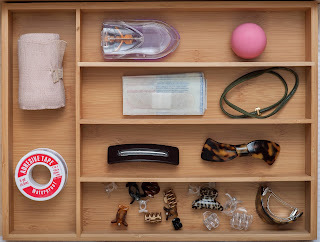 You will love the upscale looks and rich feel, not to mention how organized your drawer will be! And bamboo is a material you can feel good about using - it not only looks gorgeous but is a sustainable, eco-friendly and rapidly renewable resource. 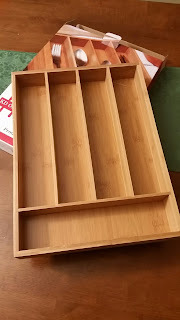 This 5-Slot Bamboo Drawer Organizer is actually really nice. It's big and the slots are deep and longer than what I was expecting. The quality is really nice and the drawer is well made. The bamboo is beautiful. It's strong and very durable. It's lightweight, but doesn't feel cheap. It's not dishwasher safe, but it's still easy to clean, I just have to wipe it down. Overall, it's definitely a lot nicer than one of those plastic ones you can purchase anywhere. I like that I don't have to just use this for organizing my silverware, but I can put it into any drawer and use it to organize just about anything. The price may be a bit high for some people for just an drawer organizer, but you get what you pay for. This would definitely make a great house warming or wedding gift. 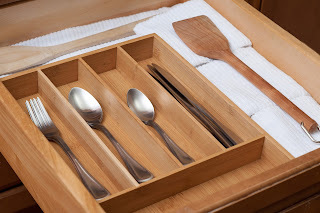 If you would like to try these out for yourself, you can purchase this KD 5-Slot Bamboo Cutlery Drawer Organizer right now from Amazon!